"Who Shot the Sheriff was great! You guys are so creative to have come up with all of the intricate plots. People were AMAZED how everything intertwined at the end. We're going to get another one in about 6 months!" "We ran your Who Shot the Sheriff game this weekend, and it was a blast! None of the 13 people that attended had done a murder mystery party before, including myself or my wife as the hosts, but the provided instructions were excellent and everything worked out great. The story was interesting and had plenty of twists and turns, and every single character had something interesting to do, even if they weren't directly involved with the murder. We are already thinking about running another, and we can't wait to try the sequel, Way Out West!" "I'd been hearing about Freeform Games for a long time, so when I heard that my friends would be hosting Who Shot the Sheriff I knew I had to be there. Never mind that I currently live about 800 miles away, I needed a vacation anyhow. My epic trek across America landed me in the Old West, complete with horseshoes, wanted posters and plenty of ten-gallon hats (well, maybe only two-gallon). A murderer was on the loose, along with plenty of bank robbers, con men, indians, proper (and improper) ladies, lawmen and layabouts. Leather boots on my feet and a fetching bonnet on my head, I tried my hand at a little thievery, jail-breaking and even occasionally assisted the forces of law and order. In the end, a grand time was had by all, though that murderer did prove remarkably difficult to corner!" "Playing Who Shot the Sheriff was easily one of my favorite of many murder mystery games I've taken part in. The game was so alive with dynamic characters that all came together under an awesome plot. Each character was so vividly portrayed and revealed as the story unfolded that I felt like I was really part of the story. The atmosphere of the evening, dressing the part, and getting into character were what made Who Shot the Sheriff one of the best games for fellowship with friends and family. We talked for days after about our experience, and even after months have passed, we still talk about how much fun it was!" "Who Shot the Sheriff was my second time at one of these types of games, and boy was it fun. Who could you trust? No one! Who did you have to trust at some time during the game? Everyone! Why is this woman watching me all the time? Why is that man avoiding me? The costumes and decorations were great, especially since I love Western themes anyway. Once you learn to let go of who you are and become the person in the game, it really gets fun. The hardest thing for me to get over was absence of rules for what you could or couldn't do in the game. Once over that, the fun really begins as you turn into your character. I can't wait for the next one!" 3. take a costume party to a whole new level. Who Shot the Sheriff gets two thumbs up!" "I must say, I found Who Shot the Sheriff to be a very enjoyable night. The way the plot was written was cleverly twisted, and led many players (including myself) to believe they had found the killer before realizing they had been following a dead end all along. I was particularly entertained by the classic Wild West feel: there was every type of character from cowboys to indians, and from bartenders to bankers. There was also a good mix of classic good guy characters, sneaky bad guys, and of course, the renegade characters who really don't pick a side and just care about themselves! It was such a great night, and I would definitely participate in another game if I was invited. In fact, I might even just host one myself! " 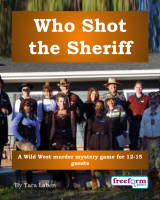 Who Shot the Sheriff is a dinner party murder mystery game for 12 to 15 guests and a host – download the free introductory pdf file. Join us in a bang-up evening of gold-hunting, investigating, six-shooting and double-dealing. You will be in the middle of the action and it will be up to you to wheel and deal with the other guests. Can you achieve your goals, keep your secrets hidden and survive Who Shot the Sheriff? It's up to you. In the summer of 1869, two stagecoaches set out from the small town of Dustville on a three-day trip across the American West to San Francisco. A new source of gold has been discovered 20 miles from San Francisco, attracting miners, prospectors and businesspeople. After two days, the stagecoaches stop for a break at a ghost town called Buzzard Creek. It's a chance to water the horses and let everyone stretch their legs. Buzzard Creek is deserted save for a few old-timers, Sheriff Cassidy, Deputy Baxter, Good-For-Nothin' Ned, and the employees of the Gold Nugget Saloon. Who Shot the Sheriff lasts for about four hours and is suited to an evening. It is often played over a meal – a finger buffet if possible to allow guests to circulate and talk in private. "Who Shot the Sheriff is great for younger players, highly recommended. " The free introductory pdf file contains an introduction to the game, a cast list of all the characters, and a copy of the Buzzard Creek Buzz – plus details of how to buy the game. Who Shot the Sheriff is unlike many murder mystery games. Although the game starts with a murder, most of the characters have more important things to do than to investigate it. And the killing may not be over – it is unlikely that everyone will survive the remainder of the evening! Who Shot the Sheriff is played just like a murder mystery game. You may be trying to solve the murder, but primarily you are (initially at least) concentrating on your own goals and objectives. Unlike most boxed murder mystery games, Who Shot the Sheriff lets you decide how to achieve your goals and thwart your enemies. "All in all I'd say Who Shot the Sheriff was a GREAT game! It was the most well thought out game that I have hosted so far. PERFECT for hosts that have experience because of the intricate plots!" On the evening of the game the guests are met by the organizer, the Bartender, and welcomed to the Gold Nugget Saloon. They then receive their detailed backgrounds – including dark secrets, objectives and money. The fun then begins as they form alliances, blackmail each other, steal items and maybe even try to murder one another! Along the way they may uncover some of the mysteries of Who Shot the Sheriff? What happened to the money stolen from the Bank of Dustville? Is the "Gold Rush Ghost" an evil spirit, or a human being? Who is the mysterious masked Stranger, and who is the notorious gold-smuggler Handlebar Harry? Depending on what the players choose to do, there are several different possible endings, but finally everyone finds out how they did, and what secrets everyone else was concealing. Who Shot the Sheriff costs £20.00 (GB pounds) or US $29.99. You can buy it in either currency, from anywhere in the world, as you prefer. The price will be converted back into your own currency for you, at today's exchange rate. We offer a Cast Iron Guarantee on all our murder mystery games. If you're not completely satisfied with Who Shot the Sheriff then please let us know within 30 days and we will refund you. See our full terms and conditions here.